If you're tired of working for someone else and you're ready to start your own motor carrier business, you've come to the right place! An authorized Motor Carrier with operating authority can deal with shippers directly with no middle man, which means you make more money! Rather than deadhead, a motor carrier can work with shippers directly or legally accept loads from licensed freight brokers on the backhaul in exchange for a small fee. Through DOTAuthority.com, you will be able to apply for your own interstate authority and process agents for all 48 continental states, find an insurance broker to satisfy the insurance requirements, secure your authority in just 3-4 weeks (trucking authority; passenger and household goods authority takes slightly longer), order our "Start a Trucking Company" start up kit. You can even sign up for our Professional Development Business and Safety Training Programs. For information, read below or call us TOLL FREE: (888)-414-1874. APPLY THROUGH DOTAUTHORITY.COM & GET AN MC NUMBER TODAY! When you apply through us, your USDOT Number, MC Number and government filing fee are included. You will also secure the required Process Agent BOC-3 form (you need an agent in each state to accept legal papers for you; we have a network of agents in place, we let you use this network and we arrange for the required USDOT BOC-3 filing). Once you apply for authority, you will need to satisfy the insurance requirement. Are you just thinking about becoming an independent carrier but not sure if you're read to take the next step? Then our $74.99 "Start a Trucking Company" kit is for you. 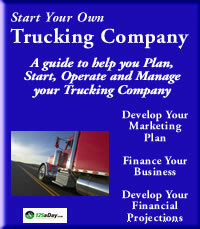 *How to start and manage your trucking company. *How to develop new customers and accounts for your trucking company business. *How to choose the best name and location for your trucking company. *How to finance your trucking company. *The licenses, regulations and permits that you will need to operate your trucking company. *How to analyze the trucking company competition to determine the best way to compete in your market area. *How much to charge for your trucking company services and how to determine the pricing structures that you should utilize. *How to establish cost and cash controls. *How to use employees, independent contractors and labor leasing companies. *Information on industry associations, publications, fleet management and regulations with website links. *How to devise your trucking company marketing plan and advertising budgets. *Government resources to assist you in the start-up and ongoing management of your trucking company business. to attend a Friday 8:00 AM - 5:00 PM program. James P. Lamb, USDOT Practitioner, Former Motor Carrier Regulator, teaches new and veteran transportation professionals how to make more money in trucking. Mr. Lamb focuses on such topics as Finding Freight in the 21st Century, Freight Rate Development, Contract Negotiations, and Sales & Marketing. Mr. Lamb shows transportation professionals how to achieve and maintain regulatory compliance, avoid notices of violation, civil penalties, fines and liability problems. Mr. Lamb provides an introduction to and general overview of Federal Motor Carrier Safety Regulations and covers such topics as Accident Monitoring, Driver Duty Status, Hours of Service, Drug and Alcohol testing, Driver Qualification, Inspection, Repair and Maintenance, Driving of Commercial Motor Vehicles and Safety Fitness. This is a course designed to share the instructors' decades of combined experience, knowledge and insight and teach the skills and techniques needed to be successful in the transportation industry. Once you're ready to start operating you may be in need of factoring. Factoring is basically the selling of a company's accounts receivable, at a discount, to a factor, who then assumes the credit risk of the account debtors and receives cash as the debtors settle their accounts. To learn more, click on the link below or just send an email to factoring@dotauthority.com and we'll have our factoring specialist contact you. LEARN MORE ABOUT HOW FACTORING CAN HELP YOUR MOTOR CARRIER BUSINESS. If you are an owner-operator, motor carriers will evaulate your driving history, your employment history, and possible your criminal history prior to contract or hire. An accurate account of your history is one of your more important assets in the hiring process. You can obtain the same information that your potential employers will see, correct incorrect information, and use it as a tool to get the job you want. LEARN MORE ABOUT GETTING, CORRECTING, AND PROTECTING YOUR INFORMATION AT WWW.DOTJOBHISTORY.COM. "How to Start an E-Business"
"How to Start a Freight Brokerage"